The scheduled block element allows to manage scheduled content within an editable. Basically the scheduled block is very similar to the standard block editable. You can configure on or multiple sub editables that are repeated multiple times as block items. 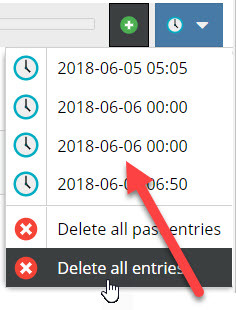 The difference is, that within the scheduled block each block item has a specific timestamp and in the frontend only one block item - the one with the corresponding timestamp - is displayed at a time (not all within a loop). In editmode, additional block items can be added and their timestamp can be configured. getCount() int Get the total amount of iterations. getCurrent() int Get the current index while looping. getElements() array Return a array for every loop to access the defined children. Select a day for the block item timestamp. Select the time for the block item with the slider. List of all block items with jump to function. 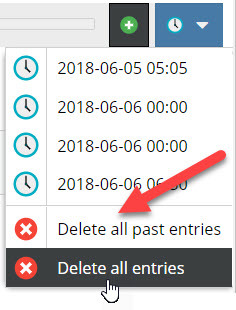 Delete all block items or all block items of the past. Please use the loop() method to iterate through all block items. This makes sure the correct indices are set internally to reference the right elements within a block. As Twig does not provide a while construct, there's a specialized function pimcore_iterate_block which allows you to iterate through all block elements. In document preview, Pimore provides a time slider to get the preview for a certain time as soon as the document has at least one scheduled block editable. For details on how to create custom functionality using the time slider see Preview Scheduled Content.